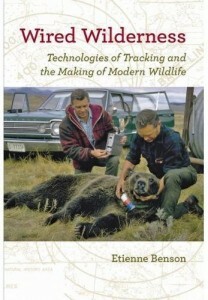 Wired Wilderness: Technologies of Tracking and the Making of Modern Wildlife (Johns Hopkins University Press, 2010). Combining approaches from environmental history, the history of science and technology, animal studies, and the cultural and political history of the United States, Etienne Benson traces the radio tracking of wild animals across a wide range of institutions, regions, and species and in a variety of contexts. He explains how hunters, animal-rights activists, and other conservation-minded groups gradually turned tagging from a tool for control into a conduit for connection with wildlife. Drawing on extensive archival research, interviews with wildlife biologists and engineers, and in-depth case studies of specific conservation issues — such as the management of deer, grouse, and other game animals in the upper Midwest and the conservation of tigers and rhinoceroses in Nepal — Benson illuminates telemetry’s context-dependent uses and meanings as well as commonalities among tagging practices. Wired Wilderness was the subject of an H-Net review roundtable (PDF) published on January 10, 2013. In January 2012 Wired Wilderness was discussed on Bernard Geoghegan’s Cultural Technologies podcast along with Jussi Parikka’s Insect Media. Wired Wilderness is available in hardcover from Powell’s Books, Amazon.com, Barnes & Noble, and other booksellers, or directly from Johns Hopkins University Press. It’s also available as an ebook in Kindle or Sony Reader formats and via Project MUSE. Previews can be found at Google Books and Amazon.